Posted by admin in Hekla, Iceland, Saturday volcano art, volcano art, volcano culture, volcano images, volcanoes. Hekla, the most active volcano in Iceland, has a distinctive elongated humped shape built up by repeated fissure eruptions and is a prominent feature of the southern Icelandic landscape. Its frequent eruptions and forbidding aspect have given this famous volcano a grim reputation: in local folklore Hekla was long known as one of the mouths of hell. In Thórarinn Thorláksson’s 1922 painting ‘Hekla from Laugurdalur’, however, the volcano is depicted in a more positive light. It rises over the landscape like a guardian spirit, the evening sunlight touching its snowy slopes with a rosy light – noble and remote, but benign. Thórarinn B. Thorláksson (1867-1924) was one of the pioneers of modern Icelandic art, concerned with exploring and expressing a distinctive Icelandic identity, particularly through the depiction of the Icelandic landscape. Thorláksson studied in Denmark and assimilated the prevailing Danish academic approach to landscape painting, which was conservative and naturalistic, but also also sought to give his work a truly Icelandic character, giving expression to the unique qualities of his homeland. He exhibited his work in Reykjavik in 1900, the first such exhibition ever held by an Icelandic painter in Iceland. Hekla and the landscapes around it were favourite subjects for Icelandic artists. Thorláksson painted Hekla many times, giving the volcano an almost iconic status as a symbol of Icelandic identity. 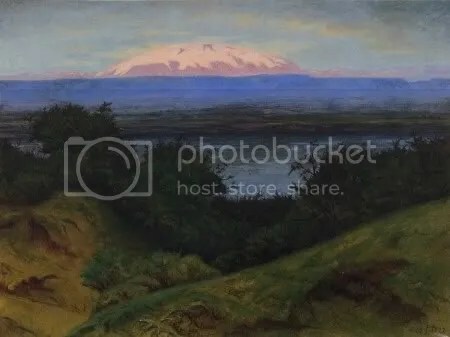 His ‘Hekla from Laugurdalur’ is a view of the volcano from the north-west, and shows Hekla rising above a green-blue landscape in which stunted vegetation and bare soil convey the ever-present tension in Iceland between barrenness and fertility. There is a sense of intimacy in the enclosed valley in the foreground, contrasting with the indeterminate spaces of the wide valley that opens beyond. Distant dark blue uplands rise like ramparts, with the volcano looming above, its form picked out with lightness and clarity. Hekla, the agent of destruction and violence, here slumbers peacefully in the light of the long Northern evening. For all ‘Saturday volcano art’ articles: Saturday volcano art « The Volcanism Blog.